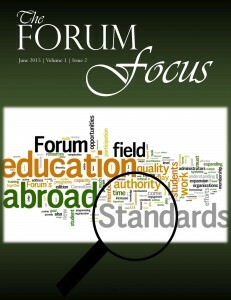 The Forum Focus is an online publication that provides perspectives on current education abroad topics and issues in the field. The Forum invites colleagues to submit articles for consideration and ideas for future topics. The word limit for articles is 1,200 and is strictly enforced. Please send submissions to: info@forumea.org. “From The Forum Council Chair,” by Kelly McLaughlin, Assistant Dean of Assessment & Deputy Director of the Center for International and Professional Experience, Yale University.